With autumn upon us and Easter being the last long public holiday weekend before winter, it’s a great time to get away for a change of scenery. The weather is invariably unpredictable no matter whether Easter falls in March or April, it could be fine it could be wet and this year was no exception. Right on the eve of Good Friday we had a raging tempest as the remains of former tropical cyclone Cook swept ashore on a southward track across the Bay of Plenty. It is likely to be the wettest April on record. Anyway thankfully the storm was short-lived and the predicted up to 150kph gales never eventuated. We made the decision to carry on with our plan to travel across to Hawkes Bay via Taupo for the long weekend accompanied by our son Mike and daughter-in-law Hayley. I’ve always loved the ‘Great Lake Taupo’. I like to think that feeling is through wonderful childhood memories of being flown up there from Christchurch to stay with my grandparents. In those days it was an exciting flight on a Vickers Viscount from Christchurch to Wellington and then a low flying Douglas DC3 from Wellington to either Rotorua or Taupo. My grandparents house had a view of Mount Tauhara and I remember spending hours staring at the bush clearings on the mountain slopes thinking I might see a deer or wild pig. I was overly optimistic. I recall the neighbours had carnations growing everywhere and I helped water them in the hot Taupo summer and grew to love those flowers. I wonder what happened to the cute girl who lived next door? There was manuka scrub land so close to the house and it was really cool to play in. We’d do some trout fishing and then at night would help weigh and bag sweets for the snack shop in the Starlight Theatre. To this day I don’t believe I have seen a movie more times than I saw ‘The King and I’ at the Starlight Theatre on one holiday stint in Taupo. I'll never forget Yul Brunner (The King) dying over and over. I think it must have traumatised me. Today Taupo is a clean modern bustling beautiful centre of approximately 25,000 residents and I always enjoy my times there. The Napier Taupo Highway passes through the high rugged hill country of the Kaiangaroa Forest and descends to the Esk River Valley in Hawkes Bay with its vineyards and orchards. We arrived in this beautiful region mid-afternoon to 24C and not a breath of wind. The night before 15,000 people in Napier were without power after former Cyclone Cook raced across this region with high winds and driving rain. This night less than 24 hours later we were dining outside on a perfect evening in downtown Napier. 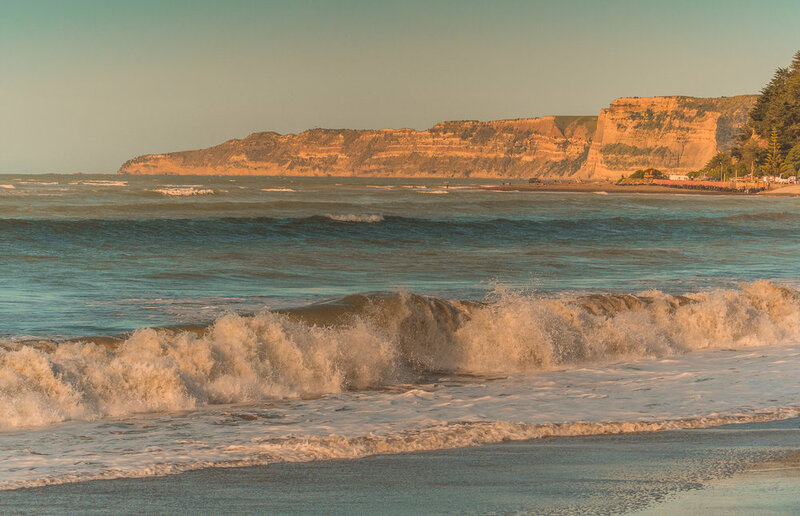 East coast beaches are quite naturally ideal when it comes to seeing the sun appear at the dawn of a new day and I wasn’t disappointed in Hawkes Bay with great conditions of clear skies and rough seas and having accommodation adjacent to the beach. It was literally a hop, skip and a jump over the Napier Gisborne railway and State Highway 2 to the rugged shoreline. Napier is a city of great character having been rebuilt after the devastating 1931 earthquake in the Art Deco and Spanish Mission styles popular at the time. It has a vibrant centre not given the soul destroying treatment of the effects of large suburban malls which have turned other city centres into ghost towns. The waterfront is well developed for community use and also is home to the National Aquarium of New Zealand. Marine Parade adjacent to the beach, like a lot of Napier has some beautiful characterful buildings such as this group known as ‘The Six Sisters’. I only got five in the photo. If you are ever in Napier the coffee shop bearing the same name and visible in the photo below is highly recommended. I initially thought it got its name from six sisters who I hoped to see behind the counter but while taking a photo afterwards it clicked (literally) that the name referred to the buildings. The Six Sisters. Sorry, the sixth one is out of frame to the right. For a panoramic view in all directions a drive up Bluff Hill does the trick. I was told that the Hawkes Bay Farmers Market in Hastings was arguably the best farmers market in New Zealand. I wouldn’t argue against that claim, it probably is. I have not been to any other farmers market that would rival this one. What a large vibrant weekly event in a truly beautiful setting. It is full of local produce, wines and artisan foods and Hawkes Bay is rich in all of these. It took no time at all to fill a bag with taste sensations. It would be easy to do a complete weekly grocery shop here. Absolutely recommended. Where did you buy the bag? Hawkes Bay Farmers Market of course. From the Farmers Market we had a quick look at the nearby city of Hastings which was in the 1960’s-1970’s the fastest growing area in the country. From then on like a lot of regional New Zealand under the new neo-liberal economic doctrine which reared its head in the 1980’s it went into economic decline. Today however it is again doing well thanks to the orchards and vineyards around its flanks. Near to Hastings is the very attractive town of Havelock North (part of Hastings District) with Te Mata Peak rising behind it. A drive up the steep narrow road to Te Mata Peak is so worth it for the extensive views across this region. Havelock North and Hastings from Te Mata Peak, Hawkes Bay. Directly below Te Mata Peak is one of many vineyards and wineries in this region, Craggy Range. What a beautiful complex and stunning location. It was a wonderful stop for lunch on Easter Sunday. Craggy Range Vineyard & Winery, Havelock North. Craggy Range Vineyard & Winery, Havelock North. A family of charolais cattle sculptures by acclaimed British sculptor Paul Day. Not too far from here is Cape Kidnappers and while we did not get out to see the largest mainland gannet colony in the world we did get to remote Clifton Beach. The beachside camping ground/motor camp there (in the right of the following photo) is like stepping back in time to simpler days of non-high tech holidays. It almost looks like time stopped there a few decades ago and there is something oddly attractive about it. So that’s a bit of an overview of a long weekend in Hawkes Bay. This country has a wealth of beauty and they weren’t short changed in this region. With its sunny Mediterranean type climate, sweeping coastline, surfeit of orchards and vineyards, and spectacular sunrises, I could live here. First light, Awatoto, Napier, NZ.